As some of you may know, I made it into Series 2 of The Great British Bake Off. The show is currently being shown in the UK on BBC2 on Tuesdays at 8.00pm. Each episode has a baking theme, and this week it was tarts. For the final round, we bakers had to present 24 miniature sweet tarts, of two differing types – so two batches of twelve. 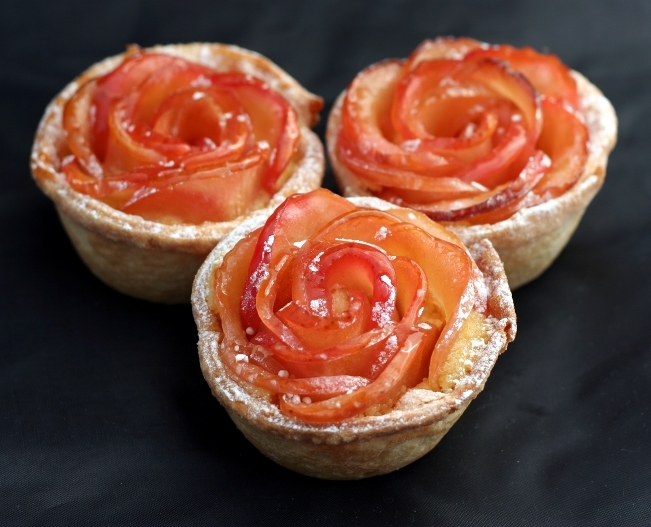 My butterscotch brulée tarts in pecan pastry didn’t get any airtime (*sob*) – but my apple rose ones did, and so I thought I’d post about them. There’s three separate elements to these – the pastry, the filling and the decoration. The pastry is a crisp sweet shortcrust, and the filling, a delicious apple custard, is based on several 18th and 19th century recipes I found. The crowning glory though, are the apple roses – slices of apple poached in apple juice and sugar and then rolled into a beautiful rose. I’ve included a little diagram I put together to help show how the roses are created. When my daughter saw these cooling on a rack, she exclaimed “Oooh! Apple posies!” – which I am REALLY tempted to use as a name because they’re so cute! A name for the tarts, that is – not as a name for me. I couldn’t pull off cute in a million years. Anyhoo – on with the recipe! With the motor running, pour in the beaten egg IN STAGES. This is important. Add about a tablespoon at a time and give the flour time to absorb the liquid. The mixture will comes together when sufficient liquid has been added. When the mixture has come together, tip it out of the processor and knead once or twice into a ball. Cover and chill for at least 30 minutes. Stir the sugar and apple juice together in a large pan until the sugar is fully dissolved. Cut apples in half vertically. Remove core and cut into thin (semi-circle) slices. Put the slices into the apple syrup and simmer gently for 10 minutes or until tender – You need the apples to be soft enough so that you can roll them, but not so soft as to fall apart. Depending on how thickly you sliced the apples, probably no more than 15 minutes. You’ll find that the colour from the skins leeches into the syrup, and turns the flesh of the apples a wonderful dusky pink. Lift the apple slices from the syrup with a slotted spoon and allow to drain/cool in a sieve. When cool enough to handle, lay out the apple slices as follows. Place 1 slice of apple on the left-hand end of your chopping board, flat side towards you. Lay the next slice so that it overlaps the first by half. Lay out 12 strips, one for each tart. Cover with cling film until required. 3 Braeburn apples – or apple of your choice. Mix the sugar, cream, egg, yolks, lemon zest & juice. Peel, core and grate the apples finely over a sieve to drain off excess juice. Stir into the egg/cream mixture. Put the cornflour into a cup and add some of the apple custard mix to it. Stir until fully combined. Stir cornflour mix into the main mixture. Roll out the pastry thinly – about 3mm. Line the holes of the cupcake tin with pastry by whatever method you prefer – I quite like the gently folded creases created by using a round cutter and parchment, but for a neater finish you could use the template method suggested here. Spoon in filling, 1-2tbs per hole. Roll up the apple slices, starting from the left hand side of the board. The overlaps will help keep everything together. Drop the resulting roses gently into each cup. Turn pan 180 degrees, then cook for another 10 minutes, until pastry is cooked and browned. While the tarts are cooking, simmer the apple/sugar mixture over a medium-high heat until thickened into a syrup. Remove tarts from the oven, leave for five minutes and then remove from the tins. Set aside to cool on a wire rack. Brush tarts with the apple syrup and sprinkle with a light dusting of icing sugar to serve. NB Make apple custard tarts with any leftover filling and pastry – 10-15 minutes in the same temperature oven, or until filling is set. If making tarts larger than cupcake size, blind bake for 10 minutes to avoid the dreaded soggy bottom, then just 10 minutes with the filling!